A regular permanent resident in northern forested areas; frequent fall migrant along the North Shore of Lake Superior and south and west of its breeding range. Common Ravens were common during the Minnesota Breeding Bird Atlas (MNBBA). Widely distributed across the northern and western United States, throughout Canada and Alaska, plus southward at higher elevations in the Appalachian Mountains (Figure 1). The highest densities are found in Nevada, western Utah, and southern California. Omnivorous, forages on carrion, insects, grains, fruit, and garbage. Highly variable; cliffs, trees, buildings, or wherever there is a suitable substrate. Breeding distribution and relative abundance of the Common Raven in North America based on the federal Breeding Bird Survey from 2011 to 2015 (Sauer et al. 2017). Roberts never recorded a nest of this species in the state, but forest rangers told him that it nests on cliffs in the boundary lakes of Saganaga and Gunflint as well as about Frear Lake in Cook County. Summer observations were so remarkable that he included sightings, such as at Cass Lake and Grand Rapids, Itasca County, in August 1916; three were seen in northern Itasca County on July 12, 1928; three were seen in eastern Pine County in July 1919; and one was seen near Eagle Mountain, Cook County, on July 6, 1922. In Roberts 1936 revision, he summarized a letter from Warden C.E. Cooke who had observed a nesting pair of Ravens on Drywood Island, Rainy Lake, St. Louis County in which he was “quite sure” it was in 1929. He also reported an additional observation of a Raven two miles north of Duluth by Frank Craighead, Jr. in July 15, 1935. Roberts (1932, 1936) concluded that “the raven is one of our disappearing birds and may be approaching extinction in the state.” He never mentioned any reasons for its disappearance but recognized that many were shot or caught in wolf traps. Green and Janssen (1975) described it as a resident in the north-central and northeastern regions. Most numerous in the Superior National Forest, it was not known in Itasca State Park until the 1960s, but it was found as far south as Mille Lacs and Pine Counties. The authors documented confirmed nesting in Carlton, Cook, Lake, and St. Louis Counties, plus inferred nesting in Koochiching County. They described its winter distribution as common in the northern regions in the 1800s and rare from about 1900 to the 1940s but increasing since the 1950s. Janssen (1987) also commented on its range expansion since the 1950s, especially “westward and very slowly southward.” He included confirmed nesting in 8 counties since 1970: Cook, Koochiching, Lake, Lake of the Woods, eastern Marshall, Roseau, St. Louis, and Wadena. Hertzel and Jansen (1998) further documented its expansion with 4 additional nesting records confirmed since 1970 in Aitkin, Beltrami, Isanti, and Pine Counties. The Minnesota Biological Survey (Minnesota Department of Natural Resources 2016) documented extensive breeding season locations throughout northern and north-central Minnesota. Surveyors detected 555 records extending westward to Becker, Clearwater, Kittson, Mahnomen, and Polk Counties. In addition, they recorded locations southwest to Todd County and south to Chisago and Mille Lacs Counties. Breeding detections were extended even further by the MNBBA, which included 2,162 records (Figure 2). Confirmed nesting was recorded from 226 blocks, including confirmed county records from Becker, Benton, Cass, Crow Wing, Hubbard, Itasca, Kittson, Mille Lacs, Morrison, Norman, Pennington, Polk, Red Lake, and Washington Counties (Figure 3; Table 1). In total, this species was observed from 27.7% of all surveyed blocks in the state (1,318/4,763). Probable nesting was also documented from 127 blocks, including south to Chisago County and west to Otter Tail County. One southeastern breeding season observation was also made in Winona County. The probability map based on the MNBBA data point counts emphasized a widespread distribution across northeastern, north-central, and northern Minnesota (Figure 4). Slightly lower populations were predicted south to northern Isanti and Washington Counties, west to eastern Becker and northeastern Otter Tail Counties, and northwest to Kittson County. Pockets of its presence were also predicted in the Hardwood Hills Ecological Subsection in western Minnesota where possible and probable nesting records from the MNBBA existed. Boarman and Heinrich (1999), in their review of the Common Raven in North America, identified “shooting, poisons, baited traps, and disappearance of bison” as primary reasons for changes in its distribution, especially on the prairies. They point out that its disappearance in the New England states was largely attributed to deforestation, conversion of land to agriculture, and increases in American Crow populations. Houston (1977) noted that the species began to inhabit cities in Saskatchewan, where they were losing their fear of man and began foraging on garbage. Boarman and Heinrich also pointed out that “raven sightings along roads increased by more than 7,600% between 1968 and 1992” in the California’s Central Valley. Cutright et al. (2006) emphasized that the Common Raven was apparently widespread from north to south in Wisconsin at the time of European settlement. However, between 1860 and 1890 the species disappeared from southern Wisconsin and declined in northern regions. The authors primarily cited increased conversion of forests to agriculture as a reason for decline in the southern regions. Breeding distribution during the Wisconsin breeding bird atlas (1995–2000) documented confirmed nesting as far south as Marquette County, which is equivalent in latitude to Minnesota’s most southeastern counties of Houston and Winona. Hence, breeding distributions in Wisconsin paralleled and even exceeded recent Minnesota southern extensions of its breeding range. Chartier et al. (2013) in Michigan cite similar examples of retractions and recovery of the Common Raven populations during the 1900s. The decline and recovery of the Common Raven appears to be due to a variety of factors. Declines in the late 1800s and early 1900s were likely associated with extensive human persecution via shooting, poisoning and trapping, conversion of vast areas of habitat to agricultural and urban landscapes, and possibly interactions with American Crows, especially at carrion feeding sites. The recovery was likely associated with reductions in human persecution with the passage of the Migratory Bird Treaty Act of 1918, loss of fear of man with additional feeding (garbage and roadkill) and nesting opportunities (e.g., towers, poles, bridges, and abandoned buildings), and in some cases with reforestation. Breeding distribution of the Common Raven in Minnesota based on the Breeding Bird Atlas (2009 – 2013). Summary statistics of observations by breeding status category for the Common Raven in Minnesota based on all blocks (each 5 km x 5 km) surveyed during the Breeding Bird Atlas (2009-2013). Summary statistics for the Common Raven observations by breeding status category for all blocks and priority blocks (each 5 km x 5 km) surveyed during the Minnesota Breeding Bird Atlas (2009-2013). Predicted breeding distribution (birds detected per 10-minute point count) of the Common Raven in Minnesota based on habitat, landscape context, and climate data gathered during the Minnesota Breeding Bird Atlas (2009-2013) using the General Linear Modeling method without an adjustment for detectability. Overall, the Common Raven is a broadly distributed species found in a variety of forest types, prairies, tundra, and grasslands. Boarman and Heinrich (1999) suggested the species prefers heavily contoured landscapes that provide thermals to facilitate long-distance foraging. Many populations prefer human settlements, while others prefer wilderness and avoid human settlements. In Minnesota the species is largely confined to heavily forested areas and human settlements, especially in the northern portion of the state (Bruggers 1988). The MNBBA habitat profile for the Common Raven based on point counts indicated a wide variety of habitats, including pine forests, bogs, upland and lowland coniferous forests, and mixed deciduous-coniferous forests (Figure 5). Breeding detections within forest cover types during the National Forest Bird (NFB) Monitoring Program (Niemi et al. 2016) were highly variable because the species can be observed or heard flying over a forest stand and at great distance from a point count location. Habitat profile for the Common Raven based on habitats within 200 m of point counts where the species was present during the Minnesota Breeding Bird Atlas (2009-2013). Partners in Flight (Rosenberg et al. 2016) estimated a North American population of 7.7 million adults. The Common Raven is also Holarctic in its distribution, so its global population is substantially higher when northern Europe and Asia are included. The high variability in detection distances from MNBBA point count locations makes estimates for breeding populations in Minnesota unreliable. 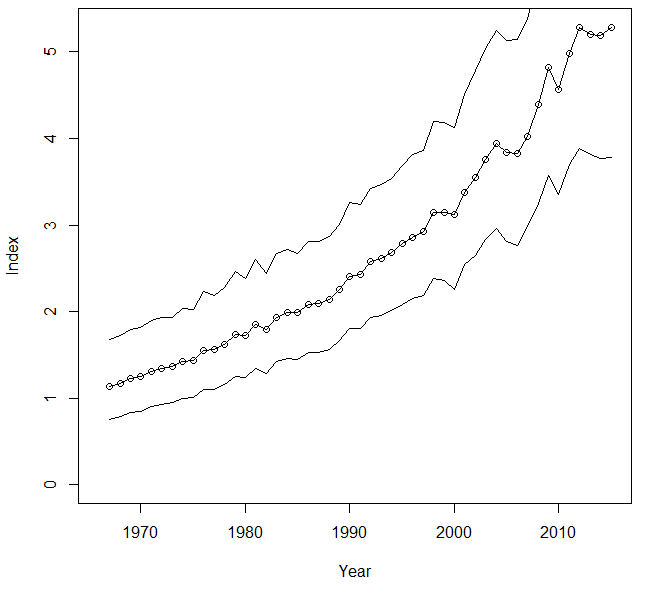 The federal Breeding Bird Survey (BBS) trends for Minnesota indicated a significantly increasing population of 3.26% per year from 1967 to 2015 (Figure 6). A significant increase in the population was also detected for Michigan and Wisconsin based on the BBS over the same time frame, but both Manitoba and Ontario recorded non-significant stable populations. Partners in Flight (Rosenberg et al. 2016) estimated a North American breeding population increase of 168% from 1970 to 2014. NFB trends were insignificant in both the Chippewa and Superior National Forests, and interestingly both showed a recent decline from 2004 to 2016 (Figure 7). Estimates of breeding densities within specific forest cover types are not possible because of the species’ sparse distribution throughout its Minnesota breeding range. However, the mean detections in the Chippewa and Superior National Forests from the NFB program both indicated 11 detections per 100-10 minute unlimited distance point counts. Boarman and Heinrich (1999) provided estimates based on active nests that ranged from 1 pair/1.4 km2 in Wyoming to 1 pair/30.6 km2 in the state of Virginia. However, they emphasized that estimates can vary widely in the same region and do not account for non-breeding adults. Breeding population trend for the Common Raven in Minnesota for 1967–2015 based on the federal Breeding Bird Survey (Sauer et al. 2017). 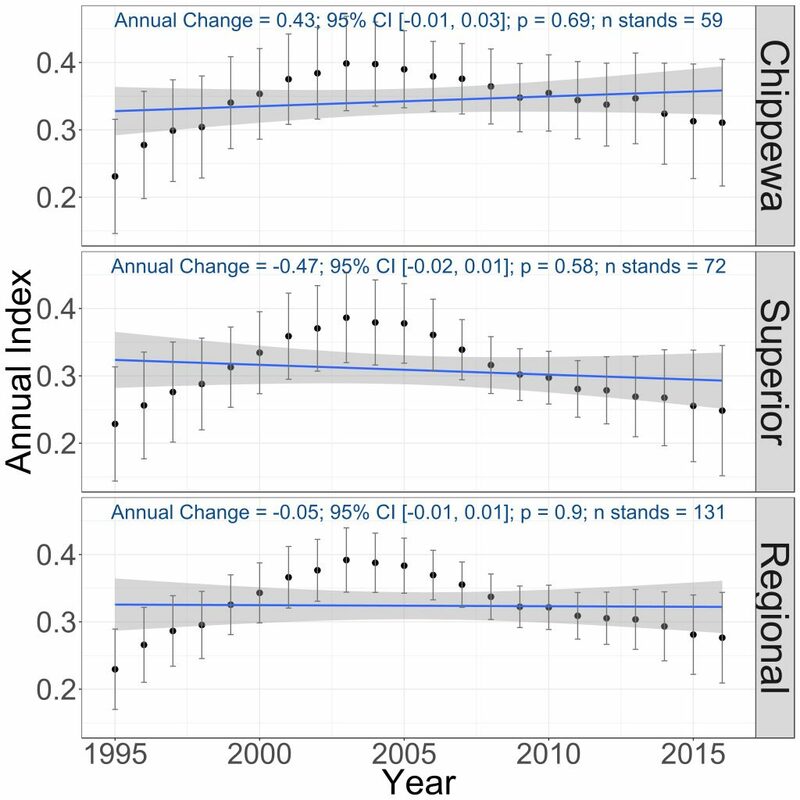 Breeding population trends of the Common Raven in the Chippewa and Superior National Forests and the combined regional trend, 1995–2016 (Bednar et al. 2016). Currently the raven’s population is secure in Minnesota, and recent increases have solidified it as a species of little conservation concern. The historical persecution of ravens continues on a more limited basis in some agricultural settings, where ravens have caused damage to economically valuable crops by consuming grains, almonds, and pistachios; destroying livestock by pecking out the eyes of calves and lambs; or preying upon game species and waterfowl eggs (Boarman and Heinrich 1999). However, in the United States the Common Raven is protected by the Migratory Bird Treaty Act of 1918. Langham et al. (2015) and the National Audubon Society (2015) identified the species as “climate threatened” despite its southward extensions and movements to lower elevations, stating “it remains to be seen if ravens are so hardy and adaptable that they may be able to ignore changing climate space with relative impunity.” The society projects that only 39% of its current summer climate space will be available by the year 2080. Bruggers, David J. 1988. “The Behavior and Ecology of the Common Raven in Northeastern Minnesota.” PhD diss., University of Minnesota. Houston, C. Stuart. 1977. “Changing Patterns of Corvidae on the Prairies.” Blue Jay 35: 149–155.